About a week ago we put up the new official World Cup Final soccer match ball. But we did not show the image or really say anything about it - UNTIL NOW! 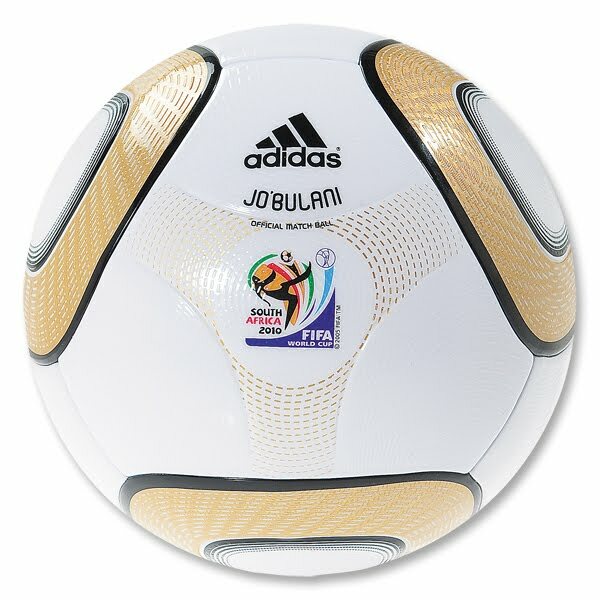 adidas World Cup 2010 Jo'Bulani Final Official Match Ball! The design of this magnificent ball honors the prestige of the match and the host city: Johannesburg. The Final will be held on July 11, 2010. The name Jo'bulani is a direct tribute to host city Johannesburg, while the Jo'bulani's golden design honors the prestige of the match and that golden FIFA World Cup Trophy that every nation wants to own and player in the world longs to hoist. The Final will be held on July 11, 2010 and we, along with the rest of the world, will be watching. Constructed with eight new thermally-bonded, spherically-shaped, 3-D EVA and TPU panels, this ball is perfectly round and has been equipped with a new Grip'n'Groove technology. Grip'n'Groove is a textured treatment that ensures the ball flies straight and true. Designed for never-before-seen power, swerve and control. It's a ball truly worthy of the best in the game.